I've just returned from the American Society for Aesthetic Plastic Surgery annual conference in Las Vegas. It was held at Mandalay Bay, and was chock full of the newest in the field of cosmetic plastic surgery. I'll post some of the 'hottest' and 'newest' trends in a future post. I had the pleasure of spending some time with two plastic surgeons whom I went to residency with, Dr. Sanjiv Kayastha and Dr. Terry Higgins. Dr. Kayastha practices outside Albany, New York, and Dr. Higgins (who has been mentioned on this site once before) practices in Vegas. Both are outstanding surgeons, and if you live in their area they would definitely be the people to see! In between attending meetings and seminars, I did spot one celebrity dining at the table next to us Monday night: Carrot Top. He was there with a couple friends and kept to himself. Wow, is he striking. That red fro combined with muscles galore makes him a sight to behold! Dr. Youn! You bring up Carrot Top and you don't say anything about his crazy plastic face? Have you not seen his before and afters? 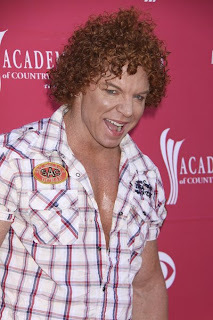 Carrot Top is so weird and altered-looking, and you should maybe tell us about that. whoa, sounds like someone has a platonic man-crush on carrot top! Love your site- you are one cool Dr.- thanks for keeping this blog going! Can you just give us a little teaser of what the newest plastic surgery "trends" are- can't wait to hear what you learned! OK, Carrot Top looks like a young Richard Simmons on steroid.